On the picturesque ancient 17th century Buiksloterdijk in Amsterdam North is our spacious apartment of 70m2 (860 sq.ft.). It is an oasis of peace and yet only 10 minutes by bike from Amsterdam centre or 6 minutes by bus, 3 stops to Amsterdam Central Station, the middle of town. In fact you are much closer to the city center than most other places in Amsterdam. The Buiksloterdijk used to be the place where the Dutch East India Company captains retired. The houses where called 'the captains heaven'. The water of the IJ-river that runs through Amsterdam used to come right to the house. Now it is a polder. Its like being close to the buzzing scene of Amsterdam and still feel like you're in the countryside. That is why this location is one of the most popular locations of Amsterdam. The view is beautiful. Overlooking the North Holland Canal. 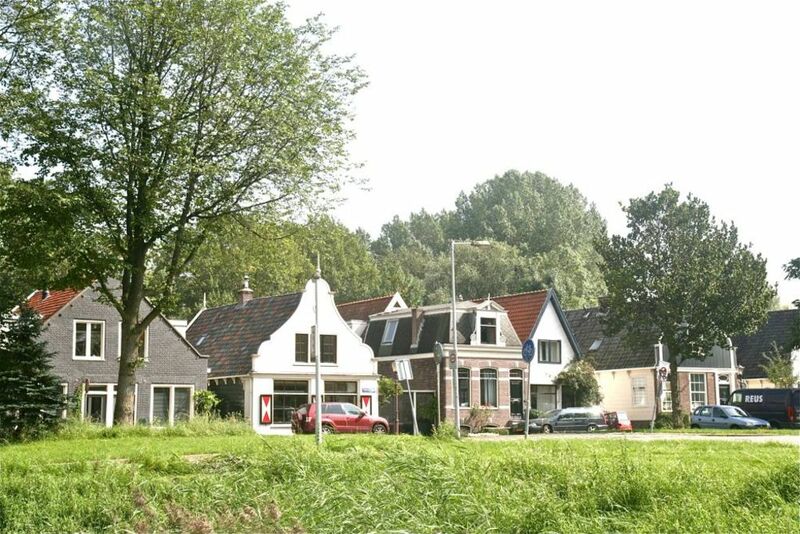 Known cycling and walking routes through rural North and Waterland go directly past our house. In front of the house (50m) is the Noorderpark and its brand new indoor/outdoor swimming pool . The bus stop to Amsterdam Central is a few minutes walking away. Busses run every 5 minutes. The bus takes 2 minutes to get to the metro station NOORDERPARK. There you change to the metro line 52, which gets you in 2 minutes to the Central Station, in 4 minutes to Dam Square and in 6 minutes to the Rijksmuseum. By car you drive through the IJ tunnel in 5 minutes to reach the center of the town (Waterlooplein) with ample parking garages. By bike just follow the cycle path in front of our house to the end and you are at the FREE ferry in 7 minutes. The ferry runs every 5/10 minutes day and night. The trip across takes 2 minutes. On the other side you are at the Central Station. You could also walk to the ferry. It is a beautiful stroll along the NH canal. Walking distance just 25 minutes. Amsterdam North is the new buzzing district for art, film and specialty restaurants, such as the IJkantine, Stork or Hotel de Goudfazant. You have access to the entire top floor of our dike house. In the front is the living room, with lovely views over the canal. There are two separate bedrooms with a real kingsize beds of 1.80m x 2.00m. One bed can be separated into two single beds. At the rear is a sunny terrace. The sun gets there already early in the morning. Ideal if you want to have breakfast outside. The apartment features a well-equipped kitchenette with a cooker, nespresso machine and all other necessary equipment. Free coffee and tea are provided. There is also a large brand new and super clean bathroom with bath and separate shower. The recently renovated apartment has free fast Wi-Fi and a flatscreen 40' television with digital cable reception. René works in the AV industry, Ellen is a school teacher. We live in the house ourselves on the ground floor and are always available for questions or help, tips or e-tickets for musea. Our house is actually very close to the city center. Much closer to the centre of town than most of the places in the Amsterdam. The feel is of a quiet village, yet your are in 15 minutes at Dam Square. Just take a bike a go along the bicycle path or take the bus and metro. Parking is cheap 13€/day. Large apartment, very sunny, beautiful view at the front and in the back. Quiet setting. Luxury furnishing and very clean. Parking is cheap. one private bathroom, recently renovated. same day laundry service. €7,50 per machine load. Sehr gute, komplette und gepflegte Ausstattung. In 9 Nächten sogar einmal die Bettwäsche und Handtücher gewechselt - ist eher unüblich in Ferienwohnungen. Gute Anbindung in die Amsterdamer City. Rene und Ellen were super nice! Die sehr schöne Wohnung befindet sich in ruhiger Wohnlage in einem älteren toll renovierten Haus. Die Wohnung ist hell, mit Blick auf einen tollen Garten und war sehr sauber. Die Vermieter waren im Vorfeld und vor Ort sehr freundlich und hilfsbereit. Wir haben uns sehr wohl gefühlt und würden jederzeit wieder dorthin gehen. Die Wohnung ist sehr zu empfehlen. Logement et accueil parfaits à recommander. Tout est conforme au descriptif, voir mieux. Transport pour le centre ville véritablement très facile, rapide et très pratique. Aucun problème avec le stationnement qui est gratuit. Quartier très agréable et calme. Excellent contact avec René et Ellen. Nous espérons revenir. Christiane & Jean Michel Leclercq France. Wir haben uns in der Wohnung sehr wohl gefühlt und waren froh wegen des regnerischen Wetters so viel Platz zu haben. Die Vermieter waren sehr hilfsbereit und freundlich. Die Wohnung war mit allem ausgestattet,was wir brauchten. Sehr bequem: der Parkplatz vor dem Haus. In die Stadt sind wir mit öffentlichen Verkehrsmitteln gefahren. Insgesamt waren wir sehr zufrieden und würden jederzeit wieder die Wohnung mieten. Die Lage überzeugt. Zentrum ist mit dem Bus schnell zu erreichen. Auto kann man direkt vor dem Haus parken. Wohnung ist großzügig und gut eingerichtet, nur der Geschirrspüler fehlt. Kann man aber drauf verzichten, da wir z.B. nur dort gefrühstückt haben. Vermieter sehr nett und hilfsbereit. Auf jedenfall empfehlenswert. Werden bei unserem nächsten Amsterdam-Besuch sicherlich wieder hier anfragen.